NAFAS means « breath » in literary Arabic : vital breath, it is the force that nurtures, inspires and creates. Ahmad Compaoré, Fred Pichot and Sylvain Terminiello have imagined an eclectic and mixed present-day music, transcending cultures and social belonging. 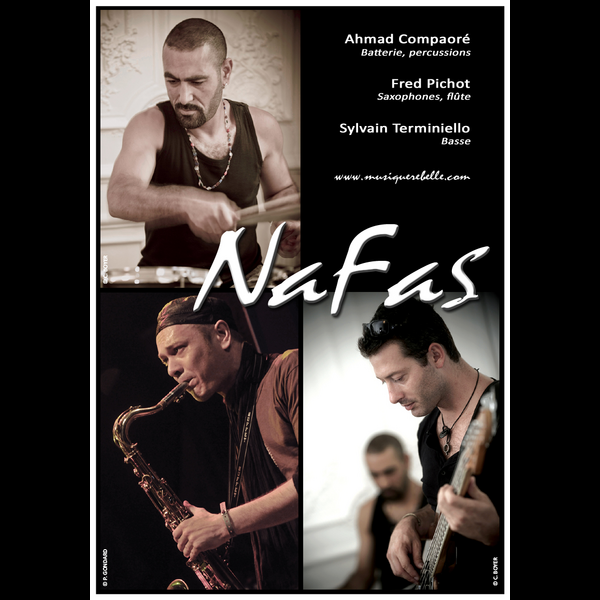 Between world and jazz fusion, their repertoire travels along the shores of the Mediterranean mixing oriental, African, Spanish-Arabic or klezmer influences, sustained by improvisation and spiced up with a touch of electro. At 23:00, the concert will be followed by a DJ set with TEE TWO + DJ BRAZE (soul funk, jazz, hip hop). The tapas bar opens at 19:00. U.Percut, 127 rue Sainte, 13007 Marseilles.